Mother's Day is just around the corner. Why not skip the flowers and impress her with a fabulous DIY dessert treat? Make her a bouquet of cake pops. First, follow my basic cakepop instructions. You can decorate these any way you like, sprinkles, edible sugar flowers, drizzle the pops with the remaining chocolate, etc. Next, display them in something cute, such as a ceramic or tin flower pot, a gift take-out box that you can get at any craft store, or even simply roll a piece of heavy stock paper into a cone and arrange the pops in it like a bouquet. Just make sure you secure the cone with clear tape, You can line all of these with colorful tissue paper and arrange the cake pops inside. Finish the design off with a colorful ribbon and you have a delightful (and delicious) gift for Mom on her special day! Put the Cake Pops on Display! 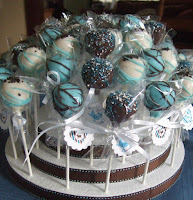 Have you ever wondered how to display cake pops? 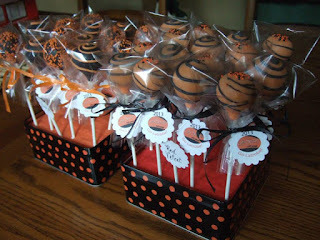 There are many ways to display your cake pops, depending on the event that you are making them for. I have done table centerpieces, individual place settings, head table displays, etc. One thing is for sure, there are a lot of ways you can be adventurous in creating a display for your cake pops. A good starting point is with a foam block, foam cones, or the round foam discs. You can also invest in a cool cake pop stand, handcrafted by one of many creative people who make and sell these. And lastly, anything that you can imagine would hold a bunch of cake pops, probably will make a lovely display with your crafty finishing touch! You can find a foam block at any craft store like Michael's or Pat Catan, or even Wal-Mart. Size varies, depending on how many cake pops you want to display. 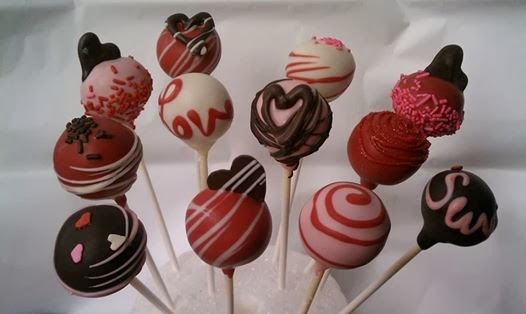 Remember to consider having about 2" distance between each cake pop on the block, so they do not get over crowded. At this point you can either put the foam inside a vessel like a basket, or just cover it with something that is thin enough to poke holes through for the cake pop sticks. I have found that crepe paper streamers are wonderful for covering the block because it is easy to work with and sticks perfectly. I just start at one end and wrap around the block until it's covered. Another item you may find at a more craft-centered store, or if you are lucky at one of the big box stores if they have a craft section. Again, I have used the streamer paper to cover the cones. What looks even nicer is to use a thick ribbon, one that is at least 1" thick. Start at the top of the cone and wind your way down to the bottom. You can either tape the end at the bottom or use straight pins to hold it in place. This creates a beautiful and dramatic display. I have used these for a more formal party, or a wedding treat table. Note of caution---they cones quickly become off balance when the cake pops are taken unevenly out of it, so it is wise to attach a plain base, like a solid piece of wood that is painted nicely or even a piece of plexiglass. This may sound complicated, but once you have the prepared cone, you can re-use it many times. These are those round, 1" thick discs, that come in many different diameters. Perfect for building a "layer cake" out of the discs! I have used 3 discs, smallest to largest layered on top of each other, and I glue the discs together to form a triple layer display. Then I take a 1" decorative ribbon, and glue it to the outside edge of each disc. I usually keep the surfaces of the discs untouched because the ribbon does the trick! I have been asked so many times if I use an electric cake pop maker, such as the popular Babycakes brand. I actually do not, because I started making cake pops before this cool little machine came on the market. Plus, this machine can make other delicious treats! Plus, I really enjoy the prep part of rolling the mashed up cake mixed with frosting to form the cake balls. 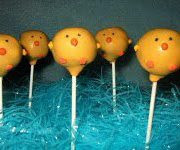 See my basic cake pop recipe for full instructions. Everyone has their own way of wanting to do things, and the electric cake pop maker can save time & effort!